Soulpepper’s new production of David French’s Jitters does not reveal it as a comic masterpiece as much as a showcase for comedic gifts of its three central characters. 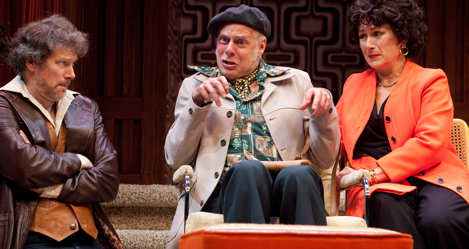 While French only tells us how the backstage disasters affects the performance of a play on stage, a play like Michael Frayn’s Noises Off (1982) has the more amusing idea of actually showing us the chaotic results. Nevertheless, Jitters (1979) is still very funny and succeeds best as a character study of those compelled to pursue the difficult life of an actor in Canada. The funniest of the play’s three acts is the first in which French sends up is own autobiographical drama Leaving Home (1972) in the form of a play-within-a-play entitled The Care and Treatment of Roses by nervous playwright Robert (Mike Ross). Staged by a small theatre company with hopes it will travel to New York, the play is meant a vehicle for Canadian star Jessica (Diane D’Aquila), who is well known in the US. This riles her co-star Patrick (C. David Johnson), who is famous in Canada but has never ventured outside its protective bubble. Both have to contend with the vagaries of veteran character actor Phil (Oliver Dennis), who can’t remember his lines and is furious the company can’t afford a prompter. D’Aquila, Johnson and Dennis anchor the show with priceless performances that locate the humour not in farcical action but within the characters’ human nature. Ross proves adept at physical comedy in Act 2, and Kevin Bundy gives the amusing impression that directing actors is not unlike teaching kindergarten. If Jordan Pettle is trying to play the officious stage manager Nick as gay, he needs to work a lot harder. Patrick Clark’s sets and costumes capture the late 1970s in all their awful shag-carpeted, bell-bottomed glory. What still resonates is the specious notion that New York is the centre of “real theatre” and that whatever happens in Canada lies in shadows until it is made “real” by the spotlight of Broadway. French seems to know that theatre people and critics only harm themselves with such internalized colonialism. We still need to find an answer for Patrick’s pertinent question, “Where but in Canada can you be a top-notch actor all your life and still die broke and anonymous?” Meanwhile, watch Jitters and watch our own stars shine. Note: A version of this review appeared in Eye Weekly 2010-07-05. In the 2016 revival the creative team remained the same but the cast had changed: Geordie Johnson played Patrick, Alex Furber played Tom and Sophia Walker played Susi. Photo: Kevin Bundy, Oliver Dennis, Diane D’Aquila. ©2016 Cylla von Tiedemann.